One of the important missions of the Turkish Coalition of America is to enhance understanding in Congress about the importance of US-Turkey relations. In pursuit of this mission, TCA provides year-around informational bulletins to members of Congress, organizes and sponsors congressional delegations to Turkey, as well as events on Capitol Hill and provides a platform for Turkish American activism and advocacy on issues that concern Turkish Americans. Through these efforts and with a view to augment the voice of citizens in support of mutually beneficial and friendly ties between nations, TCA aims to strengthen a balanced dialogue in Washington, DC on issues relating to U.S.-Turkey relations and US policies in the region. TCA takes on Sen. Robert Menendez over "ethnic politics"
Bob Livingston: HR 106: "Armenian Genocide?" 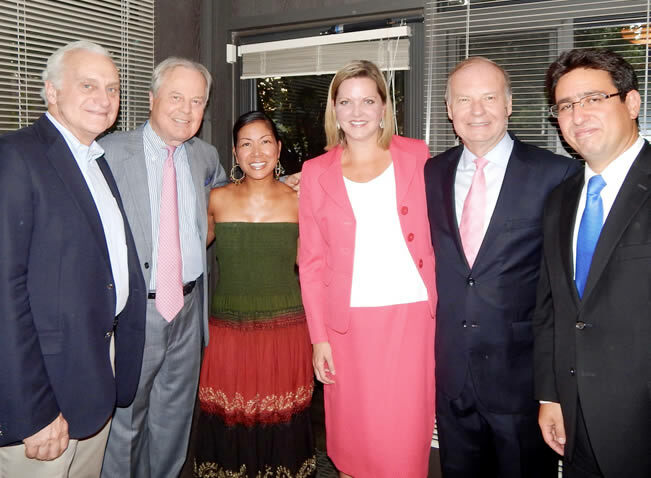 On July 29, 2016, TCA hosted a reception in honor of incoming U.S. Consul General in Istanbul Jennifer Davis and her husband, Nick Davis. The reception served to introduce them to members of the Turkish American community and officials working on Turkish issues in Washington, DC. In attendance were Turkey Caucus Co-Chair Congressman Ed Whitfield (R-KY/1st), former Member of Congress Jim Moran (D-VA/8th), former U.S. Ambassador to Turkey Francis Ricciardone, members of the Maryland House of Delegates Dan Morhaim (D/11th) and Kris Valderrama (D/26th), former U.S. diplomats who had served in Turkey, representatives from think tanks and Turkish American organizations, and members and friends of the Turkish American community. Earlier in the week, Davis visited the TCA office in Washington, DC and received a briefing on TCA and TCF. July 13, 2016: The U.S. House of Representatives passed HouseResolution 823, condemning in the strongest terms the June 28 terroristattack at the Istanbul airport, which resulted in the loss of at least 44 lives. The resolution was co-sponsored by the four co-chairs of theCongressional Caucus on U.S.-Turkey Relations and Turkish Americans:Representatives Virginia Foxx (R-NC/5th), Ed Whitfield (R-KY/1st),Gerry Connolly (D-VA/11th), and Steve Cohen (D-TN/9th). Please click here for the full text of the resolution. In a speech on the floor of the House of Representatives on Tuesday, February 23, 2016, Congresswoman Eddie Bernice Johnson (D-TX/30th) recognized Turkish American scientist Dr. Aziz Sancar for winning the Nobel Prize in Chemistry. Congresswoman Johnson is a member of the Congressional Caucus on U.S.-Turkey Relations & Turkish Americans. The transcript of her speech is available below. The following statements and tweets were issued by members of Congress after the deadly terrorist attack in Ankara, Turkey that killed at least 28 people and wounded over 60 others on February 17, 2016. Speaker of the House Paul Ryan (R-WI/1st): “On behalf of the U.S. House of Representatives, I want to offer my sincere condolences to the victims and loved ones of those killed in today’s attack. There is simply no justification for this vicious act. Today - and every day - the United States stands in solidarity with the Turkish people, who are on the front lines of the war against violent extremism." Rep. Cathy McMorris Rodgers (R-WA/5th): “My heart aches for all who were victimized by today’s brutal and senseless terrorist attack in Turkey." “As Co-Chairs of the Congressional Caucus on U.S.-Turkey Relations and Turkish Americans, we strongly condemn Russia’s repeated violations of Turkish airspace, and we join NATO in demanding that Russia respect alliance airspace. “We have already witnessed a previous Russian incursion into Turkish airspace result in tragedy. Turkey is to be commended for its restraint in the most recent violation of Turkish airspace by a Russian combat aircraft. “Russia’s actions constitute unnecessary provocations that risk escalated conflict at a time when the international community should be taking coordinated action to defeat ISIL and end the Syrian civil war. “As Co-Chairs of the Congressional Caucus on U.S.-Turkey Relations and Turkish Americans, we are profoundly troubled and saddened by the terrorist attack carried out on Tuesday in Istanbul. “We would like to extend our deepest sympathies to the victims of the attack, their families, and the people of Turkey. “We strongly condemn this senseless act of violence. Terrorism is our common enemy, and we are firmly resolved to eliminating the threat it poses to the security of Turkey, the United States, and our close allies. Congresswoman Virginia Foxx (R-NC/5th) made a speech on the House floor congratulating Turkish American Dr. Aziz Sancar and his co-recipients for winning the 2015 Nobel Prize in Chemistry. On October 21, 2015, Congressman Steve Chabot (R-OH/1st) introduced a resolution to the U.S. House of Representatives congratulating the government and people of the Republic of Turkey as they celebrate Republic Day, and for other purposes. The resolution was referred to the House Committee on Foreign Affairs and its text is available below. The Assembly of Turkish American Associations (ATAA) has an action alert urging Turkish Americans and friends of Turkey to contact their member of Congress to urge him/her to cosponsor H.Res. 484.